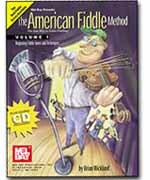 Destined to become a classic, this method provides the beginner with the elements needed to become a proficient fiddler. Based on many years of teaching experience, the author introduces the concepts and techniques that yields solid results.The book includes a downloadable CD which you access from Mel Bay's website. HIGHLY RECOMMENDED! !